As far as my opinion goes, I consider it to be an insult that a woman be considered an object which is evaluated on the basis of physical looks and not on her other qualities. Indeed for some women, it could be a liberating experience to not be judged solely on their looks and physique. Even so, Bakri and current players at her former school, Fordson High, players say they've heard trash-talk that goes beyond the usual on-court chatter — calling them terrorists, telling them to go back to their own country. In the U.S., the National Federation of State High School Associations' rules say state associations may allow a player to participate while wearing a head covering for religious reasons as long as it isn't dangerous to another player and unlikely to come off during play. The rule-making federation also allows pants, shorts or skirts. "Some schools are used to seeing girls in the hijab, but other schools find it different, odd," Hyatt Bakri said during a break from a recent practice. "After Sept. 11, they feel like we're a threat to them even though we didn't have anything to do with it. So they look at us differently." "Nothing in our religion says we can't go out and do other things just like everybody else. It's just while we're doing it, we have to be more modest maybe than everybody else," she said. Dewnya Bakri lets young players know there are ways to deal with the taunts that don't mean getting rolled over, like the time when opposing players insulted her scarf-wearing teammate during a high school tournament. "I looked at (one of them) and said 'This is for you.' I shot six threes in that game. I was guarding her and she scored zero. ITA about women being treated as objects, and it's starting even younger now. I have the hardest time finding modest clothing for the girls, and they're just 6 & 8!! I don't want my daughters to look like mini-Paris Hiltons. Reading the young women's thoughts was interesting. I also didn't know that about the US sporting rules. Then again, I don't recall seeing *any* students in my two K-12 schools wearing the hijab. Poppycock, it is forced upon women by the extreme misogyny of the Muslim man. Any Muslim woman would rather wear one of these than get a mosque-sanctioned beating from her pious husband. Women who don't want to leave Islam sadly have no choice now but to accept it and try to ignore or deny the oppression it symbolizes. You may say you like it but deep down you know that it is a pointless needless encumberment. Muslim women have lately decided they hate the west more than the oppression from their husbands and therefore have had the question made easy for them. They have to accept it now or face being called "Western". You are a patent example of ignorance regarding this subject. You project this as being forced upon the woman by her husband and being mosque sanctioned. That is poppycock. Having lived in an Islamic country and having met a lot of people, I have yet to find a single case of wife abuse. 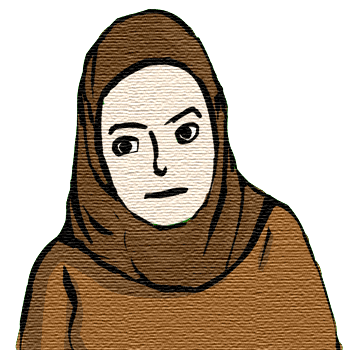 In fact, women who take up a hijab do so of their own accord and aren't forced into it. The oppression you seem to think of it as, is merely a figment of your imagination. And you round up the circle with "hate for the West". Have you actually thought about why the West is disliked so? Simply stated, if you kill any of my family without just cause, as collateral damage, I will do my utmost to hunt you down and make you suffer. You make your own enemies and create more. No sane person would even think of adopting this strategy. Somehow you seem to think you know what I think deep down when we have never met or interacted before. It shows who is the presumptuous ignorant here. Tell me what is there not to like about a woman who respects herself first and foremost, who doesn't thinks that her physical assets should be the first thing upon which a judgment regarding her is made and who knows her rights and privileges and exercises them to the fullest extent possible? It represents a society of men who can't sexually control themselves and of women who want to be judged based on their physical attributes. Now think if the women wore hijab, will they be harassed or raped so? Will there be teenage pregnancies at the high rates seen now? Definitely not. Hi, My name is Dewnya Bakri I was the girl featured in the article you are discussing. It was very heart felt to hear you inspiring comments. I really appreciate them very much. The issue of hajjab in sports is expanding rapidly there is actually a girl who will be playing basketball for the university of memphis here in the next season who wear hajjab. Inshallah our faith and ideas will change the US image of who we are and what we stand for. That is great news indeed! Keep up your good work and never feel any embarrassment in wearing the hijab - wherever and whenever you want to wear it.